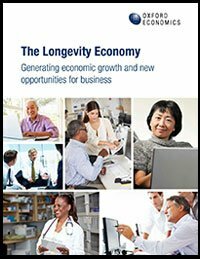 Download The Longevity Economy: Generating Economic Growth and New Opportunities for Business. Links to downloads of state and local data and analysis can be found at the bottom of this page. The Longevity Economy, “the sum of all economic activity serving the needs of Americans over 50,” is responsible for at least $7.1 trillion in economic activity every year. Overall, it accounts for nearly 100 million jobs and more than $4.5 trillion in wages and salaries. As a result, specific industries such as health care and technology are being pushed to innovate and expand in new directions. The overall economy gets a boost, too, as retirees and workers age 65 and older spend their Social Security and Medicare benefits. The economic gains cut across generations in part because people over 50 provide resources to both their parents and children. The Longevity Economy’s far-reaching influence generates significant, though complex, business opportunities. For example, companies designing and developing products that anticipate the demands of this ever-growing demographic must also account for the population’s shifting wants and needs. More than ever before, people 50-plus are choosing to stay in the workforce longer, many of them launching second careers or starting new businesses. To keep up with this shift, employers must meet the needs of a multigenerational workforce. The Longevity Economy contributes significantly to the overall U.S. economy. In a list of nations ranked by Gross Domestic Product (GDP), the Longevity Economy, at $7.1 trillion, would appear in third place, behind the U.S. and China. Many older Americans plan to remain in the workforce for a longer period of time, start second careers and work after retirement. People in their 50s and 60s start businesses at nearly twice the rate of people in their 20s. The over-50 population holds almost 80 percent of U.S. aggregate net worth, and they’re spending money — over $3 trillion in consumer spending (not including health care). From 1990 to 2010, spending on food and clothing among the 50-plus dropped and spending on recreation and education grew. The Longevity Economy drives growth of the health care industry and increased demand for home health services and aging in place technology (the vast majority of people age 50-plus say they want to stay in their own home as they grow older). Anti-aging, telemedicine and mobile health industries are also growing as a result of the Longevity Economy. Older Americans are tech-savvy and shop online as frequently as younger Americans. However, they spend more online than younger generations do — on average, $650 over three months. Older Americans bolster the larger economy in a variety of ways. More than 90 percent of Americans between the ages of 47 and 65 have provided financial assistance to their adult children. Charitable contributions from people over 50 account for nearly 70 percent of all donations from individuals. To take advantage of the opportunities created by the Longevity Economy, businesses should keep ahead of health care trends, adjust to longer working lives and a multigenerational work force, recognize new spending habits and not ignore the importance of technology for people over 50. See the Longevity Economy in relation to the GDP of nations in Figure 2 on page 6. For a summary of how the Longevity Economy impacts traditional and new industries, see the sidebars on pages 12 and 13. A graph traces the dramatic shift in spending habits, from necessary to recreational goods, among 50-plus Americans in Figure 5 on page 10. Helping with college loans or tuition and allowing children to move home rent-free tops a chart that shows the types of financial assistance older parents have provided their adult children in Figure 7 on page 16. You might also want to take a look at Mapping the Longevity Economy, a presentation made by AARP to the 2012 What's Next Boomer Business Summit.